directed work that can be completed prior (4,7,10) or presented during (5) the program. Our 2.5 hour Archaeology Girl Scout program begins with a tour through our museum, followed by a power point presentation on archaeology and specifically careers in archaeology and a hands-on program entitled, Archaeological Site Analysis. 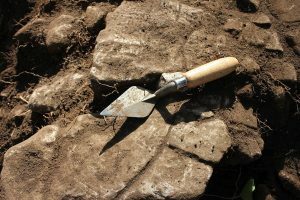 In this program girl scouts will be introduced to what an archaeologist actually does, including how we find sites, what we do when we discover a site, and how to properly record and excavate a site. The girls will be divided into two groups and assigned the roles of archaeologists excavating two archaeological sites. They will first devise research questions and hypotheses about their excavation unit, and then get the opportunity to excavate for artifacts in their unit. Once they have excavated their sites, they will analyze the artifacts, and as a team address and answer their original research questions. They will share their findings with the other group. We will end this program with a discussion on the importance of preserving archaeological sites, and our role as site stewards in helping to protect our cultural resources.